I’m been thinking about exploring for a little while now. Specifically, I’m been thinking about what captures the imagination of kids and inspires them to explore when they get older. 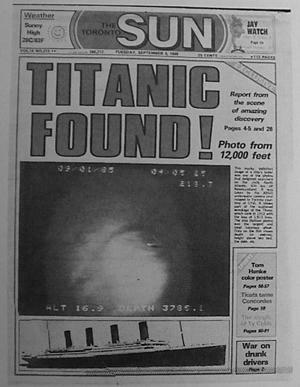 I remember my dad coming home when I was 9 with a copy of the Toronto Sun declaring that the Titanic had been found. It was a profound experience in my life: someone had explored the depths of the ocean and had found a ship lost for generations. In the 1980s, there was still an active space program and, suddenly, an active program exploring the seas. The world around me was exciting and I read everything that I could about sea exploration. When Bob Ballard, who found the Titanic, was mapping a shipwreck at the bottom of Lake Ontario, I was one of thousands of school kids who got to watch via telepresence – an early form of taking part in a webinar. I actually got to speak to one of my heroes! In short, exploration was in my blood and, it should be of little surprise that my own play was about exploring and, as I grew older, I explored farther and farther afield. As an adult, I identify with exploring as a way of life and always try to keep moving our society forward. So, where does the next generation of explorers come from? It’s true that there are still rocket launches and sea explorers, but it doesn’t hit our collective conciousness in the same way. I think that it’s up to all of us to inspire children to explore the world around them. Give them a magnifying glass and a notebook. Get them a bird book and ask them to keep track of what they see. Give them a map and see if they can figure out where they are. Make them the navigators on your next road trip (take extra gas) and see where you end up. I don’t know what the next frontier of exploration is going to be, but I know that if we don’t keep inspiring our children to look farther afield, just over the next horizon, we will never get there. Exploring is a part of our nature, but we have to nurture it, or it will disappear. When I was about ten, my dad and I went for a walk in the woods nearby what we called “the old cottage.” The old cottage was built by my great grandfather out of stone at Cedar Point, on Georgian Bay and Dad was doing what all fathers do, helping me experience a little bit of his childhood. We were exploring a little bit and looking for the remains of two square log cabins that were rotting in the wood, no doubt from the earliest days of logging in the area. We found the cabins, one had full walls and no roof and the other was just a few logs on the ground. It amazes me to this day that those cabins, which must have been far beyond the reaches of civilization when they were built – there were no roads to them – were still standing just a few hours north of Toronto in the eighties. They had lastest at least sixty years, and probably longer, as lonely shells in the woods. I haven’t gone back to look for them in the past twenty five years, but I suspect that parts of them are still back there, quietly returning to the earth. It also amazes me a little bit that I can still picture that day perfectly. It was sunny and the sunlight filtered down to the forest floor a little bit through the canopy of trees. It must have rained the night before or there was heavy dew because I got wet in the undergrowth. There was a bit of a trail, but it was overgrown and dad showed me how to hold branches so that they didn’t hit the person behind you on the trail, something that I do to this day. I hadn’t yet joined Scouts at this point in my life, so these were new lessons to me and they made an impression, so much so that I think of them often. 1) There are few times in a child’s life when their brain is learning so much as when they are tweens or teens. Their brains are growing and forming pathways almost as quickly as when they are babies. If you want to make an impression, make it on a ten or twelve year old. They may be sullen little brats, but it will shape their lives forever. 2) Time spent with parents when you’re a kid is really important. I’m sure I remember this day so well because I was with my dad. I’ve tried a whole bunch of times to recreate the magic of that adventure with friends, and it’s never the same but I’ve had similar experiences with my son. Parent – child time is important. 3) We were on an adventure. My dad and I have done lots of cool things together: he taught me to paddle a canoe, how to set up a tent and how to rebuild a sports car but the adventures we went on stick out in my mind. I have more memories of heading out in our little boat to camp on another island and walks through the woods than of just about any other thing that I have done with my dad (and we’ve done lots of cool things). Adventure is special. 4) We were doing something new and unique – we were finding a cabin. We were explorers and we were adventurers. In those days, before I was a teenager and knew everything, my dad was the coolest and this sort of thing was so cool! Parents have an amazingly strong connection with their kids. Even teenagers admire their parents. This is an amazing thing and something that we need to take advantage of while we still can. We need to enjoy it with our kids.